"I came from Switzerland to attend your workshop. After many fertility specialists telling me my only chance at motherhood would be egg donation or adoption"
"They said...with an FSH of 150 and a barely detectable AMH of 0.01, I would never conceive naturally! They were wrong, Julia, I think your work is sooooo important..."
"It worked. Our first IVF and we’re having twins…I continue to use the tools for different reasons...As you said, Julia, in vitro can be a road of healing if you make it so." "I remember during those early days just doing your Nine Hearts Imagery over and over again even though I was petrified of another failure…"
"I wasn’t less of a mother, woman, person, catholic, or wife for seeking generosity from an egg donor." What is it I need most RIGHT NOW and how do I get it? To be unable to conceive; to go through a battery of fertility testing and then be told you have unexplained infertility, can send anyone into a tailspin of despair. Especially when the experts said you were an easy case, but here you are 6 failed IUI’s and 3 Failed IVF’s later, and now you’re a “poor responder” to fertility drugs. 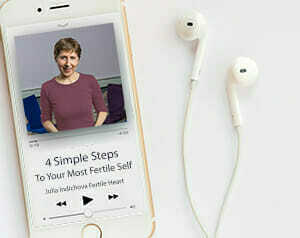 In the Fertile Heart OVUM Program successful treatment for unexplained infertility starts with tuning in to the guidance of your own body and heart and the natural fertility expert within. 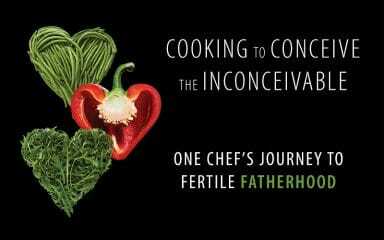 For a shot of inspiration take a look at the Fertility Success Stories video, to hear how the I.B.O.W. Program helped others turn their failed IUI’s and even multiple failed IVF’s into a chance to birth healthy babies and fertile lives. Success rates with infertility treatments vary greatly. There is no shortage of studies to point toward the link between a woman’s age, and stress level and her chances of successful IVF treatment. Egg quality and advanced maternal age is what we hear when it’s another failed IVF , failed IUI, or a chemical pregnancy. But maybe when we look deeper than “stress” & stop turning the biological clock into a time bomb, maybe then an old fashioned conception or success with IUI after a failed IVF is quite within reach. The I.B.O.W. program includes a unique way of working with food and fertility supplements and designing your very own fertility diet and natural fertility treatment protocol, if you decide to take a break from assisted reproduction. You can also use the food and supplement guidance to augment your IVF or egg donation treatment. Everything you do with food, herbs, or the Fertile Heart mind body tools will increase egg quality and boost your chances of conceiving the family you long for. And when those two lines finally show up on your pregnancy test, take a look at the do’s and don’ts of choosing the best prenatal vitamins for you and the baby. The journey to become your healthiest, most fertile self continues. Welcome! The pilgrimage toward a second child and all that I learned through it has enlarged and in many ways saved my life. The tools of the Fertile Heart practice and the power they hold to create change, continues to amaze me. What I've also learned through this particular challenge and journey is that real growth and healing requires consistent commitment, and inner work. The most common misunderstanding about the story I shared in Inconceivable is that getting pregnant depends on finding the right acupuncturist, massage therapist, or yoga class and following a generic "fertility diet." All of those resources can be helpful but if we don’t fully engage in our own healing we miss a most important resource. Perhaps at some point I'll have a chance to meet you in person. In the meanwhile, keep walking. And remember, you don't need to "make it happen." All you need to do is meet your child halfway! Julia’s Blog: Does the Universe Really Have Your Back? Sign up for the FertileHeart News and receive a free copy of an inspiring ebook, announcements about free community chats, recipes and other goodies.